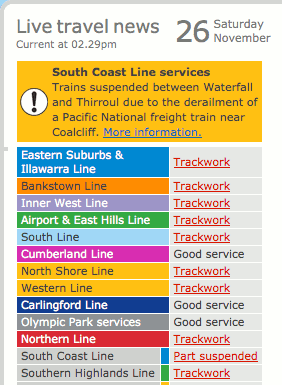 Trackwork across almost all lines and a derailment! Our tax dollars at work. Makes me think there's more to this than trackwork. Perhaps there's a more serious issue, like a malfunctioning control system. One would think the CityRail folks wouldn't be short sighted enough to have effectively scheduled trackwork across the entire network at the same time. Newer post ← Witnessing NASA #Curiosity #MSL launch, from bed!